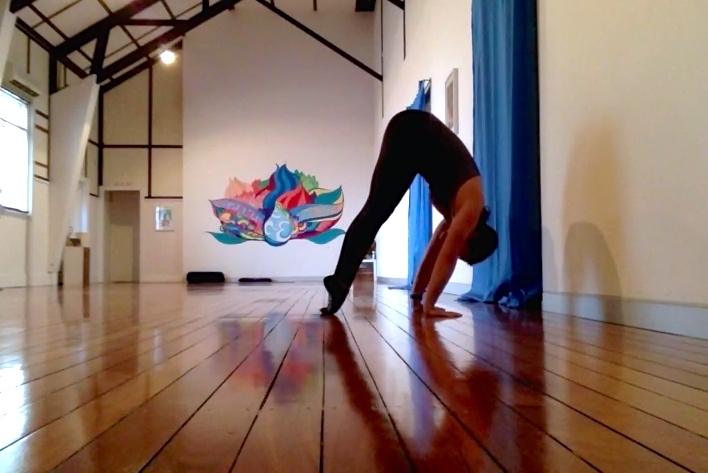 Handstands are undoubtedly one of the most difficult asanas to learn in the practice of yoga. 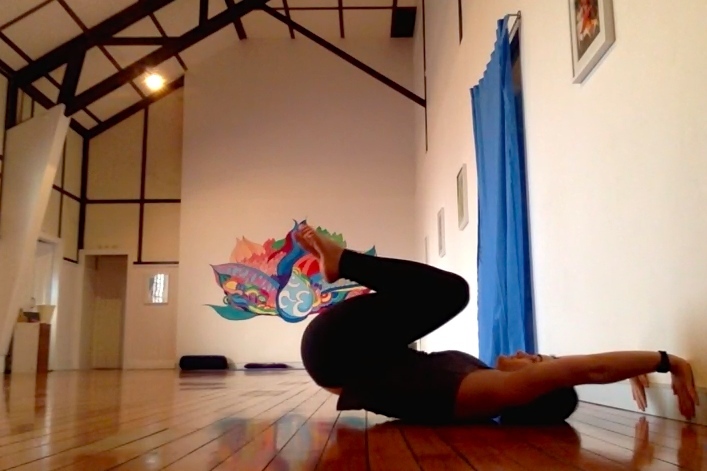 There are many ways to develop the strength you need to support yourself upside down but the key is to target both the deeper muscles of the core and the muscles of the shoulder girdle. 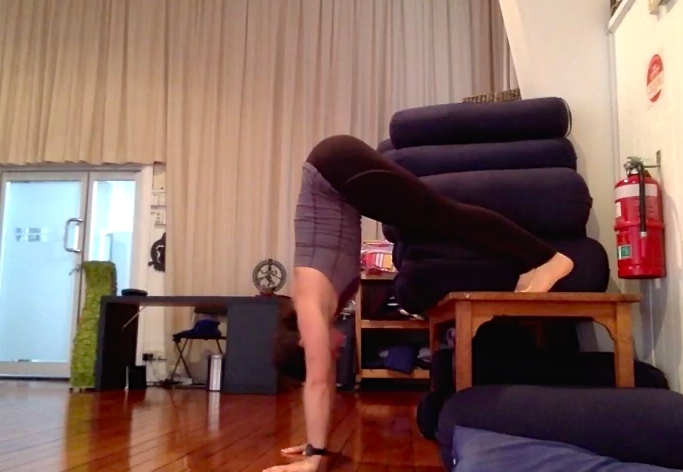 Here are five great handstand exercises you may not have tried yet. As always, be mindful of what your body is telling you and avoid doing too much too soon. Take breaks as you need know that sometimes less is more when you are starting out. As the name suggests, you’ll need to have on a pair of socks for this exercise. You can also use a towel—anything that will allow you to slide on the floor. 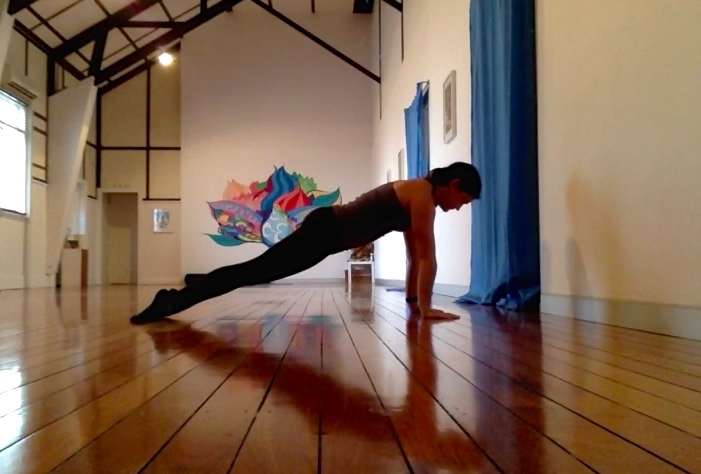 Come into a high plank position with the tops of your feet on the floor. 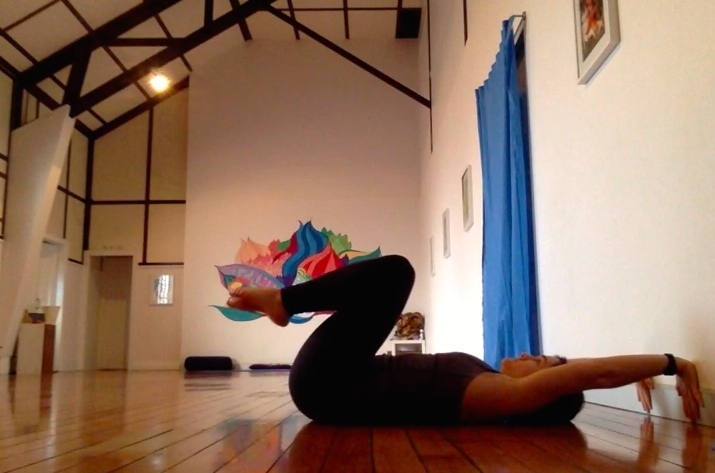 Press the floor away and then pick your hips up as your draw the legs in as close as possible to the arms. Then slide the feet backwards to the starting plank position. Repeat 3 to 5 times and build from there. This exercise is about learning how to use the upper body and core together, so avoid throwing everything into your wrists by pulling more from the low belly. You’ll need to grab a pair of socks for this one as well. Place your feet on the wall and begin to walk your hands back. Leave enough room between your torso and the wall that you'll be able to tuck your knees into your chest. You'll have to play around with exactly how much space is suitable. The closer you are to the wall, the more you’ll have to pull the knees in—which is more work for the core and therefore more difficult in general. Moving slowly, slide the backs of your feet up and down the wall, initiating the movement with your core. Squeeze your upper arms in towards one another to stabilize and push the floor away as you straighten the legs. Start with just three to five repetitions, focusing on your alignment. Then perhaps try walking yourself a little closer in and repeat. Come into a Plank Position with your feet resting on something that is approximately an arm’s length in height from the floor. Hug your inner thighs towards one another, pull the low belly in, and then begin to walk the hands back towards your feet. 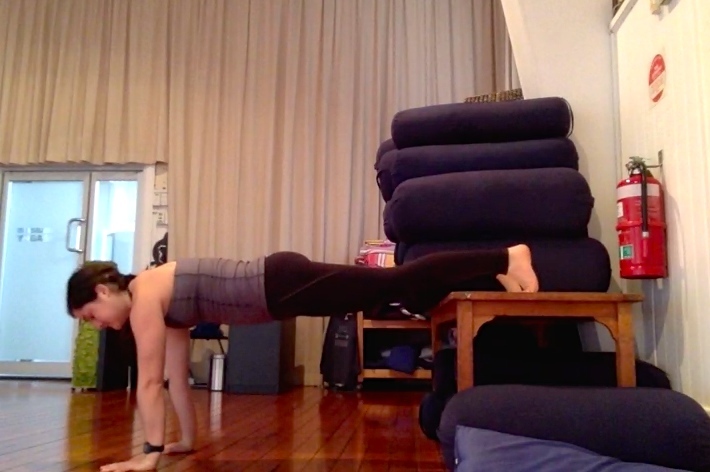 You’ll find that it becomes significantly harder the closer you get, so just take it as far as you can in good alignment and then walk yourself back out into plank. Ideally you’ll want to walk yourself back to the point that your shoulders are stacked beneath your hips, but just go as far as you can whilst maintaining the integrity of the posture. Repeat 3 to 5 times, moving slowly and focusing on your breath. 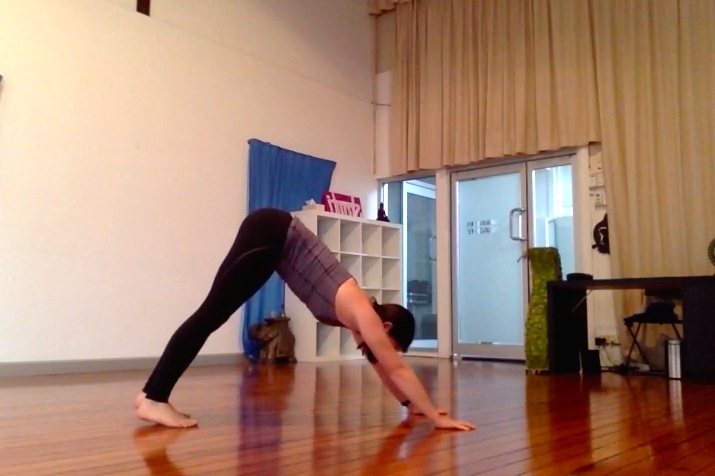 Take yourself into a Downward Facing Dog and then walk it in about a foot or so. Shift your shoulders over your wrists and then, leading with the core, draw one leg forward and try to tap the back of your wrist with the toes. Then switch to the other side. Try at least twice on each side and then build your repetitions from there. This is perhaps the most challenging exercise on this list because it not only requires substantial strength in the abdominals, hip flexors, and shoulders, but it requires flexibility in the hamstrings as well. 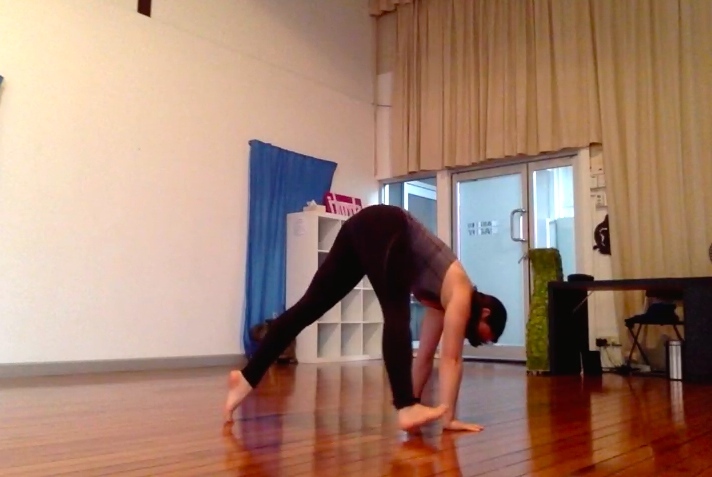 Don’t be discouraged if you can’t quite tap the back of the wrists with your toes—just take it as far as you can and then switch to the other side. Naturally, the more you practice it, the closer you’ll get. Come down onto your back close enough to the wall so that you can reach your arms up overhead and press your palms firmly into it. Squeeze your arms in towards one another as your push the wall away and then draw your navel in as you pull your knees towards your chest. As you maintain your grip on the wall, start to curl your sacrum up off the floor, initiating movement from your belly. Hold it there for 15 to 30 seconds and then place your tailbone back on the floor as slowly as possible. Repeat as many times as you can until you start to lose your form—you might just start with one.